Even though I have not come across this scenario in practice, I am imagining a situation where a test product is rapidly dissolving (>85% in 30 mins) while the comparator product is very rapidly dissolving (>85% in 15 mins) and vice versa. Is f2 calculation necessary? If it is, which time points will be used? I am aware, the requirements are different for different NRAs (USFDA, EMEA, WHO, etc). I will appreciate if these are taken into account when answering this question. » […] a situation where a test product is rapidly dissolving (>85% in 30 mins) while the comparator product is very rapidly dissolving (>85% in 15 mins) and vice versa. Is f2 calculation necessary? If it is, which time points will be used? Only one measurement included for test product. Not more than one mean value for each formulation. Maximum of one time-point of the reference product. Hence, bad luck for the EMA. For the FDA and the WHO, it depends. BTW, what is an FFP? » » […] a situation where a test product is rapidly dissolving (>85% in 30 mins) while the comparator product is very rapidly dissolving (>85% in 15 mins) and vice versa. Is f2 calculation necessary? If it is, which time points will be used? I think in this case a calculation of f2 is necessary, as the condition for not required calculation of f2 is not exist. when both test and reference products dissolve 85 percent or more of the label amount of the drug in 15 minutes using all three dissolution media recommended above, the profile comparison with an f2 test is unnecessary. The differences in the GL's as mentioned in the reply of Helmut concerned how and when an additional time point after reaching the 85% release amount can be included in the calculation. As not more than 1 time point is allowed to be added in the calculation of f2 after reaching the 85% releasing time point (can be at time points 45min, 60min, ...). » ƒ2 is generally not required if product(s!) release ≥85% in all three media. You said Product(s) and not Products. So that means there are instances where f2 calculation can be shelved when only one product (either test or comparator product) releases >85% of API in 15 minutes? If the 5, 10, 15, 20, 25, 30 and 45 mins dissolution values for the test product were 32%, 63%, 88%, 91%, 95%, 96% and 97% respectively. And that of the Comparator were 23%, 44%, 52%, 65%, 76%, 89% and 92% respectively. Is f2 calculation required going by USFDA, EMA and WHO GLs? If it is, how's the calculation done? » Only one measurement included for test product. » Not more than one mean value for each formulation. » Maximum of one time-point of the reference product. I really don't understand. Please can you explain further. I'm still a beginner in this field. » BTW, what is an FFP? Oops. Thought I wrote FPP. apologies for the typo. » If the 5, 10, 15, 20, 25, 30 and 45 mins dissolution values for the test product were 32%, 63%, 88%, 91%, 95%, 96% and 97% respectively. And that of the Comparator were 23%, 44%, 52%, 65%, 76%, 89% and 92% respectively. » Is f2 calculation required going by USFDA, EMA and WHO GLs? If it is, how's the calculation done? Yes, you need to calculate the f2 value regardless the GL's, as your Comparator didn't achieve a release of ≥85% at the time point 15 min. » Yes, you need to calculate the f2 value regardless the GL's, as your Comparator didn't achieve a release of ≥85% at the time point 15 min. If the dissolution values for the Comparator product were 32%, 63%, 88%, 91%, 95%, 96% and 97% respectively. And that of the Test product were 23%, 44%, 52%, 65%, 76%, 89% and 92% respectively. Want to know what USFDA, EMA and WHO recommends in the above case scenario. I actually did the calculation and got an f2 of 99.5. However the reason I wanted someone else to the calculation is to know the time points to use. I used time points of 5, 10, 15, 20, 25, 30 mins because the comparator product was able to achieve >85% dissolution at 30 mins. Wanted to know if I'm right. » If the dissolution values for the Comparator product were 32%, 63%, 88%, 91%, 95%, 96% and 97% respectively. And that of the Test product were 23%, 44%, 52%, 65%, 76%, 89% and 92% respectively. Here also you have to calculate the f2 factor as your test drug didn't achieve a release of ≥85% at the time point 15 min..
» Want to know what USFDA, EMA and WHO recommends in the above case scenario. » I actually did the calculation and got an f2 of 99.5. However the reason I wanted someone else to the calculation is to know the time points to use. 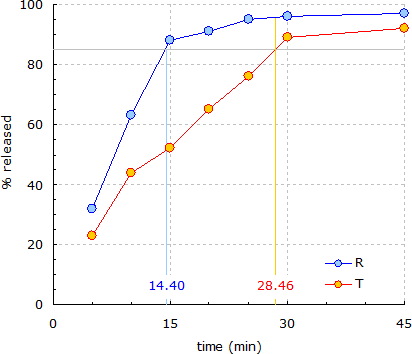 I used time points of 5, 10, 15, 20, 25, 30 mins because the comparator product was able to achieve >85% dissolution at 30 mins. Wanted to know if I'm right. - according to WHO your time points (till to 30 min.) included in the calculations of f2 are not correct as you have to add only one time point after reaching the 85% release for your reference drug, i.e only till 20 min. - but according to FDA & EMA you have to include the 45min time point too. » Here also you have to calculate the f2 factor as your test drug didn't achieve a release of ≥85% at the time point 15 min..
» - according to WHO your time points (till to 30 min.) included in the calculations of f2 are not correct as you have to add only one time point after reaching the 85% release for your reference drug, i.e only till 20 min. » - but according to FDA & EMA you have to include the 45min time point too. For the second scenario, I thought it should be till 15 mins for WHO and till 30 mins for FDA and EMA. This because the time point for the comparator at 15 mins was 88% while the time point for the test product at 30 mins was 89%. These were the points when >85% was first achieved. Please confirm if I'm right. Thanks so much for your time. I appreciate. » For the second scenario, I thought it should be till 15 mins for WHO and till 30 mins for FDA and EMA. This because the time point for the comparator at 15 mins was 88% while the time point for the test product at 30 mins was 89%. These were the points when >85% was first achieved. Please confirm if I'm right. Regarding your last post, I had a different understanding of the last time point to use when calculating for f2. I had thought the next time point after achieving 85% release (or time point at asymptote) should be used. For reference product, exactly 85% release was achieved at a timepoint in between 10 and 15mins (even though this timepoint was not measured) thus the closest measured timepoint of 15mins should be the additional timepoint after 85% release has been achieved (ie >85% release will achieved at that timepoint). Similarly, for the test product, exactly 85% release will be achieved at a timepoint in between 25 and 30mins. Thus the minimal timepoint when greater than 85% was achieved becomes 30 mins. I had to read the guidelines over again and I couldn't find anything wrong with my mine. But I also couldn't disprove yours either. Perhaps Ohlbe, Helmut as well as others could weigh in their thoughts on this. I’m not sure which approach is the ‘correct’ one. 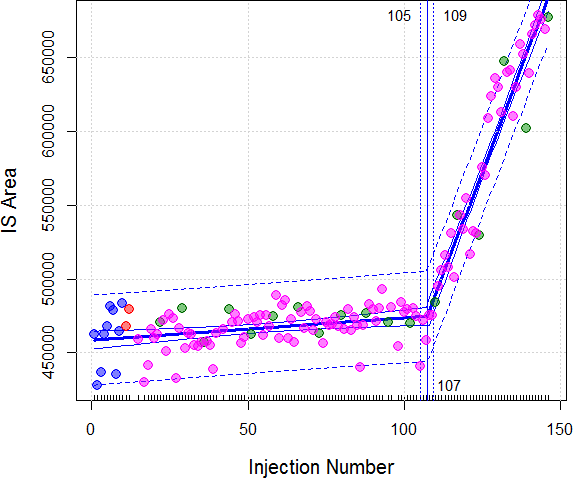 Highlighted rows at linear interpolated times for 85% release of R and T, respectively. Can you elaborate how you arrived in this post at an ƒ2 of 99.5? Just by looking at the curves such a high ƒ2 does not seem to be possible. I'm glad seeing your response. I noticed you used two case scenarios when calculating for f1 and f2. Is it that the guidelines are very specific as to the last timepoint to use when calculating for f1 and f2? I had thought the last time point to use in f1 and f2 calculation should be the timepoint when more than 85% dissolution has been achieved. Also if the values were switched between Test and Reference, what will be the decision to take using both FDA and WHO guidelines? I'm guessing both FDA and WHO will use the timepoint 30 minutes (ƒ1 24.95, ƒ2 33.16). » Can you elaborate how you arrived in this post at an ƒ2 of 99.5? Just by looking at the curves such a high ƒ2 does not seem to be possible. Seen your calculation. Now I know where I got it wrong. I transformed the percentages to decimals (ie 23% to 0.23) before doing the calculations which is wrong. Thanks. FPP, not FFP: finished pharmaceutical product (=formulation). (Well, FFP could stand for finished farmaceutical product, following a bold proposal for revised spelling rules sticking to the pronunciation). Oh dear, am I developing dislexia? EMA: Not more than one mean value of > 85% dissolved for any of the formulations. FDA: Only one measurement should be considered after 85 percent dissolution of both products.